Today our day started with an hour-long genealogy lesson. Koreans probably have the best historical records in the world. For instance, they kept a daily record of each king’s reign. In addition to things like who came to court to ask for help or lodge a complaint, they even wrote down what mood the king was in that day. They also keep clan books of every family clan, going back to at least 900 AD. I previously mentioned the Kim Hae clan’s genealogical record, which we saw in the National Museum. Well, the National Library has gazillions of these clan books, and if you want to do genealogical research, you can go to the library and request access to copies of your clan’s records. Stephen’s Dad copied all the relevant pages from the Bay clan books, going back to 1765 (the book covers ancestors back to 874 AD though). In the first generation of the Heunghae Bay clan in which records were kept, Stephen’s ancestor, Bay Hyung Kyung, was one of the generals who staged the coup (reportedly with a single gun) that marked the beginning of the Goryeo dynasty. I had my Korean history book with me, and I was able to read about the incident right then and there. From this ancestor, Stephen is the 33rd generation. In general, it is much easier for Koreans to trace their ancestry because the record-keeping has been excellent for hundreds of years. 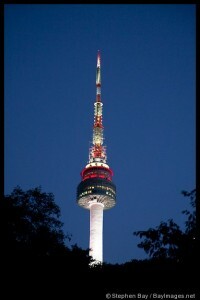 At twilight, N Seoul Tower rises above Namsan Mountain in Seoul, South Korea. After class, we went to Namsan and the N Seoul Tower. Namsan is the mountain in Seoul that everybody walks up and down for exercise. It is especially popular with the elderly. That is not to say it is a hill. It is just that Koreans are generally in very good shape. Stephen’s Dad said he hikes the mountain twice a week. We took the bus up and walked back down (approximately 2 miles). Anyway, it was more crowded than usual because there was a big festival going on. I am scared of heights and wanted Stephen and his Dad to go up without me, but I wasn’t given a choice, so up I went. I stayed as close to the center as possible, but it turned out that I had lots of school kids to entertain, so I was distracted from the height. We had the usual short English conversations, and then I amazed them by reading their names off their nametags. The kids are so much fun because they seem to think it is a miracle if a white person can read Korean. Heck, even the adults think it is quite a feat. It doesn’t hurt that the Korean alphabet is probably the most logical alphabet in the world and exceedingly easy to learn. We had lunch at a restaurant in the tower. It was fixed price and part of it was buffet and the main course was one of five choices. Stephen’s Dad ordered us all the seafood, because you are required to get the most expensive thing off the menu when it is fixed price, so I didn’t even attempt to get my choice, which was tofu and mushrooms. I ate all the seafood except the two little octopuses on a skewer. I just couldn’t manage that. I did try and take a lot of seared tuna from the buffet, in addition to all the cheap crap I like. Love locks at N Seoul Tower, Namsan. When we went back down to the bottom, there was an observation deck with chainlink fence festooned with thousands of little padlocks. 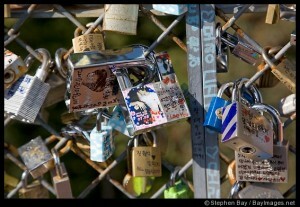 Stephen’s Dad said they were love locks – couples put them there when they get married or engaged. They all had things written on them, mostly the couples names and sometimes a picture of the couple. The funniest one I saw said “Buket List” (I assume they meant bucket list). I loved that their bucket list included putting a lock on the fence at N’Seoul Tower. They had signs all over the place asking people not to attach their locks to the fence because it was in danger of falling. They also had signs saying not to throw away your key, which I thought was kind of funny. 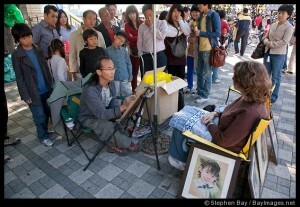 Sitting for my portrait on Namsan while a crowd gathers. Then Stephen’s Dad saw a pastel portrait artist and wanted both Stephen and I to have our portraits made. He told me to go first. I had to sit and stare at a fixed spot for nearly a half hour. It attracted a huge crowd, which made it even harder to keep still with all these people staring at me. I thought it was just because people wanted to see if the portrait looked like me, but when it was Stephen’s turn, he had a crowd of about six people. I realized so many were watching my portrait being made because I was the bigger freak show. The portraits were really good. Mine looked a little more like me, but he spent longer on my portrait (Stephen’s Dad said it was because women are more sensitive). The festival was called Mokmyuksanchoneje. Mokmyuk is another name for Namsan. There were performances all afternoon, but the main event was a ritual performed by a priest, which was to replicate rituals performed there 600 years ago. I was a little confused whether this was a Confucian ritual or a shamanistic ritual – the program didn’t really say. There were a couple dancers who were really good, but the main portion with the priest (or shaman) performing the rites was really long and I got tired of standing. It concluded with the guy walking across some blades with bare feet, which was kind of interesting. 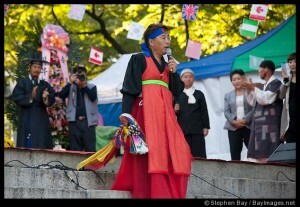 A shaman priest performs a ritual as part of Mongmyeoksancheonje. When it finally ended, we walked down the mountain, which was actually much more pleasant than the bus ride up. We headed to the train station, but we stopped first at Kinko’s so Stephen’s Dad could make photocopies of our portraits. 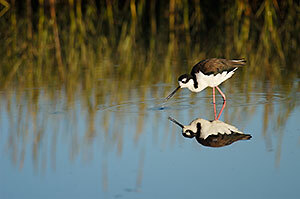 He was apparently dissatisfied with the young man’s copying skills, because we were there for an hour. It was nearly 8 pm when we left Kinko’s, so we stopped for some Mandu (steamed dumplings) and finally headed home. We were exhausted. Check out more of Stephen’s pictures of South Korea.